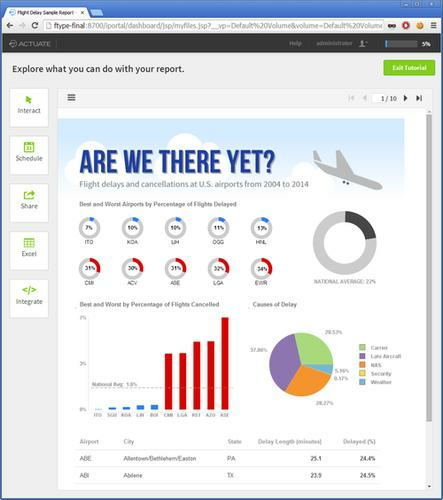 The gratis software "is a free server for developers to deploy their reports, visualizations and applications," said Nobby Akiha, Actuate senior vice president of marketing. The software, called BIRT iHub F-Type, is being marketed to organizational departments that want to create their own reports, but are unsure about investing in full-fledged enterprise reporting software. It can also provide an easy starting point for developing and testing a new analysis project. BIRT iHub F-Type is based on Actuate's flagship enterprise software for reporting the results of data analysis jobs, called BIRT iHub, which itself is based on the open-source BIRT project, co-founded by Actuate. BIRT (Business Intelligence and Reporting Tools) is a framework built on the Eclipse code editor for analyzing data and then producing reports from that analysis. More than 3.5 million developers have used BIRT in some capacity, Actuate has estimated. While organizations can cobble together their own BIRT-based systems, it is easier and more cost effective to use a commercial package such as Actuate's, which has already integrated and configured the various BIRT components, Akiha said. Users can run the software to produce up to 50MB of output each day, which can be enough to produce hundreds of reports, with copious tables, charts and other visualizations. Developers will still need another piece of software to specify how the data should be analyzed. They can use either Actuate commercial software for the task or the BIRT open-source designer. If users consistently produce more than 50MB per day, they can upgrade to paid versions of the software, starting at US$500 per month for an additional 50MB a day. Or, users can move to the full version of iHub, which has been reinforced to work on larger jobs. As a provider of analysis and reporting software, Actuate competes with companies such as SAP, IBM and Oracle, all of which have similar products. Because BIRT is open source, it can be easily tested by software developers, which is not usually the case with proprietary analysis products, said Stephen O'Grady, an analyst for the IT analyst firm RedMonk.